The wind you feel onboard a moving boat is a combination of true wind and boatspeed (the apparent wind). 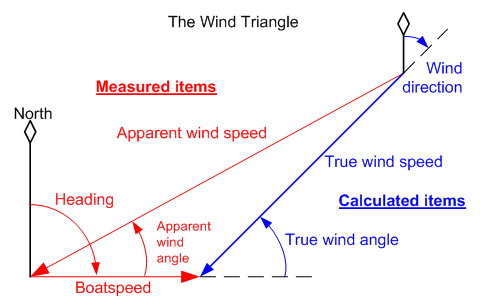 By solving the wind triangle, true wind speed and angle is obtained from the measured apparent wind, heel and boatspeed. Wind direction is then the sum of true wind angle and heading. True wind direction and speed is god’s work, and therefore should not change with the boat’s sailing condition. If it is incorrectly calculated, then it will change as you sail in a different direction. There is a good way to test for a valid solution: by seeing how much the wind direction changes when you tack or gybe (the ‘wiggle’). There are two frames of reference for wind, each with its own advantages. Ground relative. This is the ‘normal’ way of thinking when on land. “Wind’s from the nor’east at 60”. If you strapped an instrument on a car and drove around, the wind direction would always report as 45° (ignoring magnetic variation of course). All meteorology is earth-based and true north oriented, so earth-true is the number you have to use when route planning. Using earth-based boatspeed & heading alone prevents the calculation of current. When converting to water-true, say for next-leg apparent, the local current and magnetic variation must be considered. Water relative. On the water, the true wind that the boat feels is a combination of the earth-true and current. If the current is significant, water-true wind will be different from earth-true. The boat responds to water-true because the keel is immersed in the water. Polar plots always use water-relative reference. True wind angles are the same on both tacks (except for wind shear). 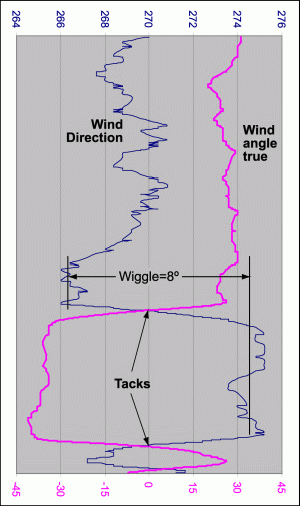 If wind direction were calculated using COG/SOG, the true wind angles would be different on the opposite tacks (more on the difference here). When being used for performance, because of this symmetry, water-true is the number to use. Current is calculated by comparing water-based boatspeed & heading+leeway with COG/SOG. The Ockam system displays water-true unless COG/SOG is replacing boatspeed/heading. OckamSoft has a BIF for outputting earth-true. For more about wind relativity, see Lee Bow Effect. There are many misunderstandings about technology afloat. For an explanation of why and when you should buck the trend, see Common Myths.